Rumor has it the oldest house in Manhattan gives shelter to its ancient residents still. The dark and drafty Morris-Jumel Mansion that sits Uptown has housed George Washington and his revolutionary troops. It's inspired "Hamilton" creator Lin-Manuel Miranda and been used as a bawdy tavern enjoyed by New York's historic drinking class. But it's the daughter of a prostitute who married — and possibly killed — a French wine merchant and became one of New York's richest women that visitors still hope to see — more than 150 years after she died. 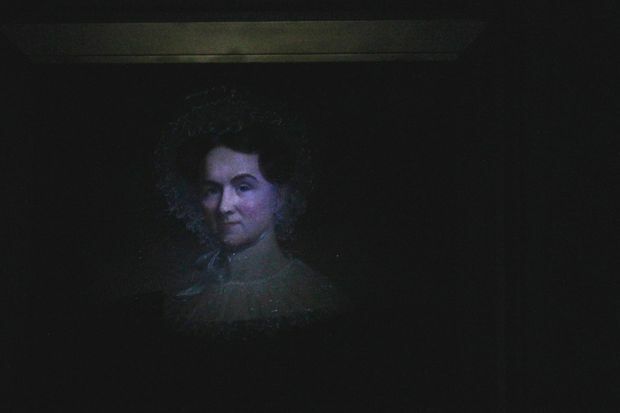 Eliza Jumel's ghostly footsteps are heard often, as are her whispers and rustlings as her spirit moves through her home, many visitors have said. A crowd of noisy kids visiting the Jumel Terrace building were once shushed by a mysterious woman standing at a balcony. Later, they saw the woman again — in a framed portrait of Jumel hanging on the walls. Built by British colonel Roger Morris in 1765 in what today is Washington Heights, the home sat on a huge estate that stretched from the Harlem to the Hudson rivers. After Morris fled the revolution, it served many purposes — including acting as military headquarters for Gen. Washington and his men — before becoming a museum in 1904. Jumel, whose husband bought the property in 1810, was a businesswoman in her own right. She made and managed significant real estate acquisitions that made her among the wealthiest women in New York. She outlived her first husband, who many think she tricked into marriage and who mysteriously fell from a carriage onto a pitch fork. She went on to marry former Vice President Aaron Burr, the man famed for killing Alexander Hamilton in a duel. She was divorcing him when he also died. The history inspired "Hamilton" writer Miranda, who wrote two of his musical's Aaron Burr songs while sitting in the VP's bedroom in the house. Jumel continued to live in her mansion until she died aged 90 in 1865. And the museum's program and events manager Vincent Carbonne still takes groups of people to meet her. Carbone, armed with tools like K2 meters, laser grid pens and motion detectors, leads believers and skeptics on monthly tours of the premises after nightfall. Along with seeking paranormal activity near Jumel's deathbed, the tours halt on a staircase where a drunken Hessian solder is said to have fallen to his death, and in the servant's quarters where a young woman took a suicide leap. "People come in here and they start screaming at the ghosts," said Carbone, "You're not going to get nothing like that." Carbone starts each paranormal investigation by introducing himself and his guests to the spirits and expressing his respect. Ghost hunters creep through the pitch black mansion, checking readings on K2 meters and watching for moving objects or apparitions. They explore historic rooms usually barred to the museum's regular visitors. "Paranormal investigation is just another way for me to get a better understanding of the world around me and what could possibly be after we die," Carbone said. "It's a great alternative view of history." The Morris Jumel Mansion's next paranormal investigation will be on Saturday, Oct. 29 from 10 p.m. to 1 a.m., just in time for Halloween. More information is here.